The Produb licence is a more recent addition to the legal requirements for DJs. It is managed by the MCPS-PRS Alliance, responsible for payment of royalties to music composers, publishers and writers. Full details can be found on their website at: www.prsformusic.com. 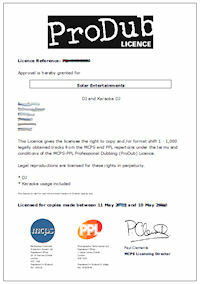 The Produb licence is required by all professional or semi-professional Disc Jockeys and Karaoke Jockeys in the UK who make extra copies of or format-shift their music or karaoke files (format-shifting means converting music or karaoke files from one format to another, such as from CD to MP3). Though the ProDub licence is relatively new and not currently enforced as vigorously as public liability insurance or portable appliance testing, it is worth noting that some venues, as part of their own public performance licence, may check if a DJ requires a ProDub licence and, if so, seek verification that a licence is held. If a DJ requires a Produb licence but does not carry the appropriate certification, they could well be refused access to some venues, with the obvious consequences for your event. With the above in mind, it is always worth checking if your DJ requires a ProDub licence and, if so, checking that they will be carrying the appropriate certification when attending your event. Solar Entertainments carry our Produb certification at all times.